For the Love of Blue and Leopard Print – Lovely.Multifaceted.Chic. I hope everyone has had a great week. I’ve been busy with working on two research papers and I had to step away and get on the blog. I have been enjoying the color blue lately. I wore this outfit on Sunday for church. I love this leopard print skirt and I wear it often. I wanted to go for casual, comfort, and style. If you want to dress a solid t-shirt, wear a bold print skirt. I added a belt to my outfit to bring a little more style without over doing it. 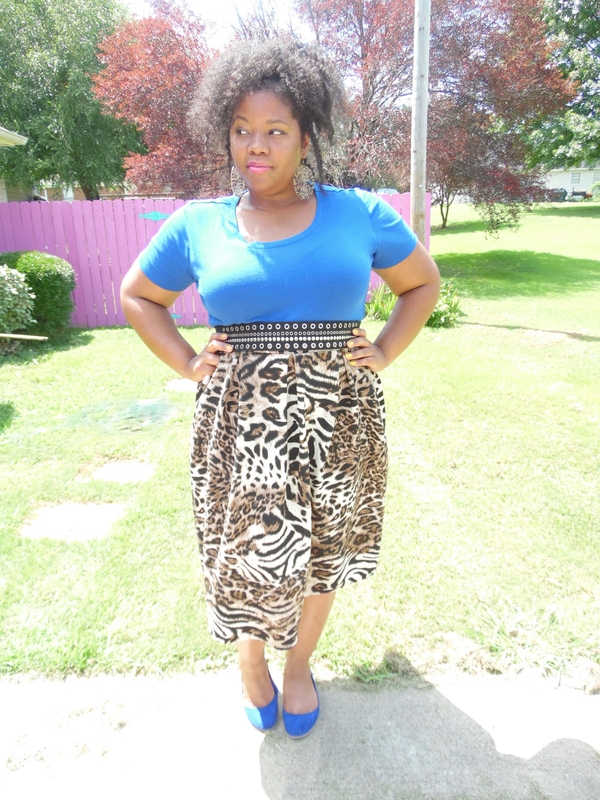 I also wore leopard print earrings from the blog boutique. My shirt, skirt, and shoes are from Rainbow. My belt is from Cato. I wore my hair in a high puff ponytail. Thanks for reading and feel free to leave comments and like!